Yesterday Google launched an early access preview of Android Studio, an integrated development environment (IDE) for Android based on IntelliJ IDEA. This one-stop shop for coding, compiling, and testing includes all the standard Android SDK tools, plus build support, quick fixes, tools to catch major coding flaws, and a preview window. The Android Developer Tools session at Google I/O went into massive detail on the new project. The 53-minute session is embedded below, in case you couldn't make it. One of the cooler features of Android Studio is the multitalented preview window, which shows your code running on mock-ups of most of the standard Nexus devices in a real-time layout. You can even see what your app looks like in multiple languages. There's also a full WYSIWIG layout editor that works across several screen sizes and resolutions, though this is still a work in progress. Google wants to make sure that you know this is a preview build - it's marked v0.1 on the developer website. Android Studio is available for free on Windows, OS X, and Linux. Developer.Android.com also has some tips on getting started, and a handy guide for migrating to Android Studio from Eclipse. 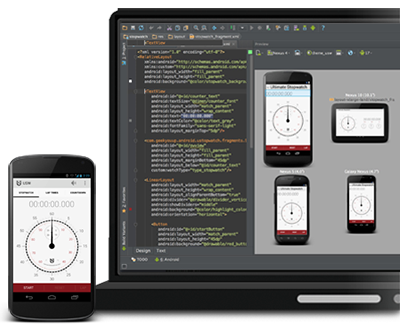 You can check out the source code for Android Studio here.